Blush and Bangs: Hello Miss Apple Feature! I have been following the boutique jeweler @HelloMissApple on Instagram for a while now, and found myself quickly becoming a fan of her work. Not only are each of her jewelry pieces adorable, on trend, and well made, but they are also completely affordable for the everyday girl! I wanted to share a few favorites of mine with you guys that I pulled from her site Hello Miss Apple. Be sure to go visit and purchase some of her pieces for your own collection!! 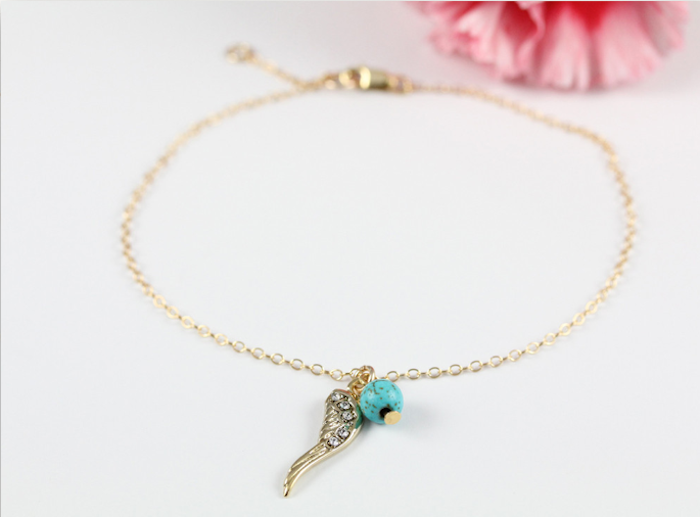 This angel wing anklet is probably one of my absolute favorite pieces on the site! I love the charms and the splash of color added by the turquoise! I'm obsessed with anklets right now, and this one is clutch! Get it here! 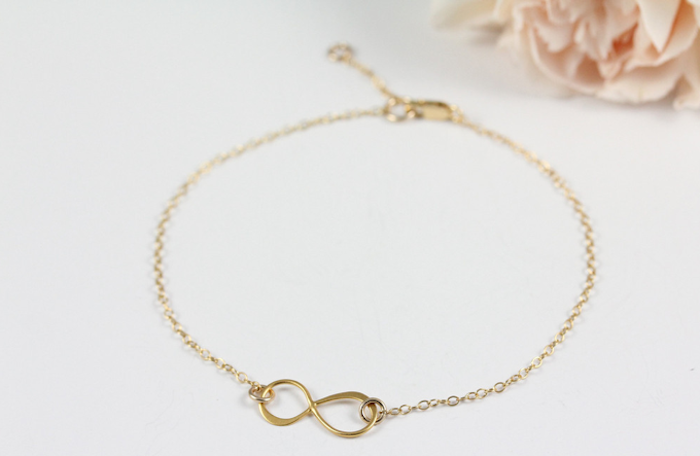 I also love this gold infinity anklet! Simple, delicate, lovely :) Get it here! 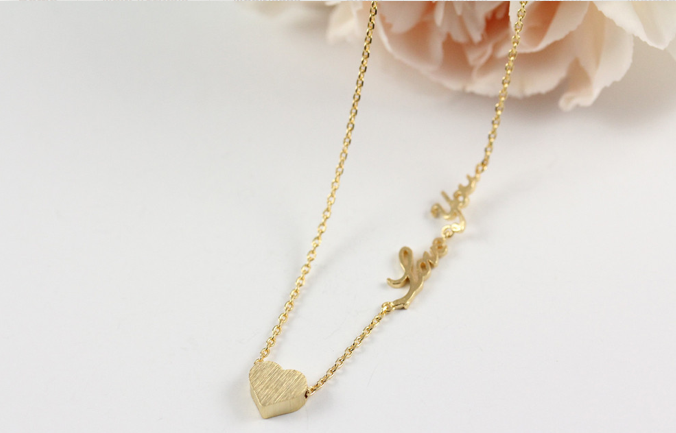 The sideways chain writing on this love necklace is so perfect! It's such a beautiful detail and makes this piece unique and fresh. Get it here! Surprise, surprise, the francophile loves the Eiffel Tower necklace, lol! But, it's just soo cute! 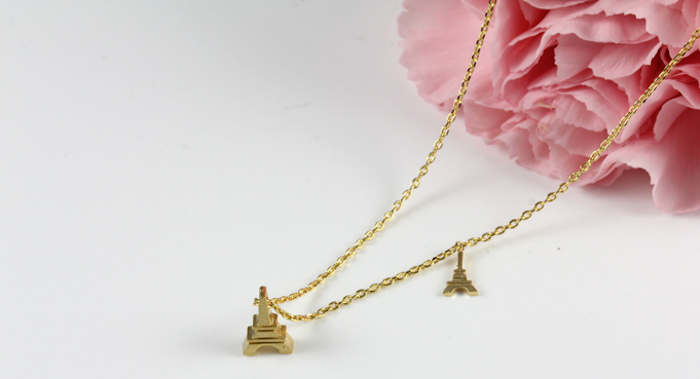 I love the different sizes and the spacial separation of the two Eiffel Towers on the chain. Get it here cherie! For someone who is generally not a buyer of wide rings, I think this Heart Double Tiara ring is gorgeous! I like that even though it's a wide ring, it's not chunky, so it still comes off as being a delicate and intricate piece rather than a busy one :) Get it here! I love the "Best Friends" engraving on the interior of this gold infinity ring. It's like a secret that only you and your closest friends are privy to! I definitely would get this for myself and my girlfriends! Get yours here! Lastly, I think this bow bracelet is really sweet, and perfect to adorn your wrist on its own or to stack with other bracelets! It's girly without being overbearingly so, and the delicate work is simple and beautiful so you can wear it for a plethora of occasions! Pick yours up here! Hope you all love these pieces as much as I do, and be sure to stop by Hello Miss Apple to find the perfect piece for you!